In case you missed it two new exciting updates are coming along to our clients WordPress!!! WooCommerce 3.5 was released two weeks ago and WordPress 5.0 will be released later this month ago. BIG changes! While we strongly encourage you to install the latest version we want you to take note that this is a major update for WordPress. It is always best to be prepared and ensure you backup your system before, or have your development team do this for you. First check what version of WooCommerce you are running. 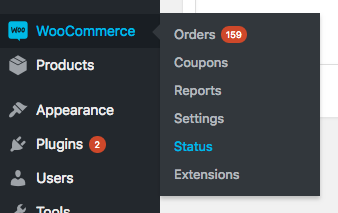 Go to WooCommerce -> Status and take notes on your WooCommerce and WordPress version.